 Welcome to the Love and Respect App! We are glad you're here. 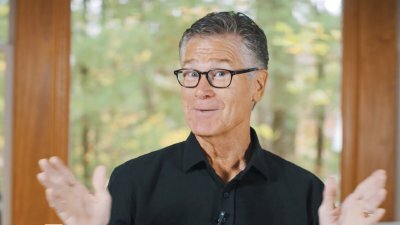 Video: How Do You Say "No" To Your Child? While many folks associate the Love and Respect message with husbands and wives, I have my PhD in Child and Family Ecology. I studied the family, and taught about family for many years but waited until my children were adults and could speak back into what we did as parents. Whether you have younger or older children, I share the foundational principles for parenting successfully in God’s eyes. I waited for 35 years to write on parenting so my adult children could share wisdom gained from the good, the bad, and the ugly of their family life. When me and my wife Sarah (also a child of divorce) became parents, we turned to God's Word to discover His parenting plan for their family. We hope the resources in this app are an eye-opening exploration of the Biblical principles on parenting that can help make families function as God intended. Although all the resources in the app are free, consider two major resources if you want to delve deeper: - Love and Respect in the Family: I take an depth look at a child’s need for love and a parent’s need for respect. God instructs children to honor father and mother, but how do parents deal with those moments when they feel disrespected? 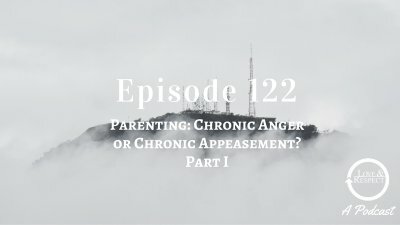 How can parents stop the negative reactions in the family and motivate the children to respond positively? Please read this parenting book! - Mother and Son: The Respect Effect: Mothers have written to tell me of the incredible impact Respect Talk has had on their sons. However, prior to learning about Respect Talk to boys, these moms were unaware of how a few vocabulary words could affect the heart of a boy. 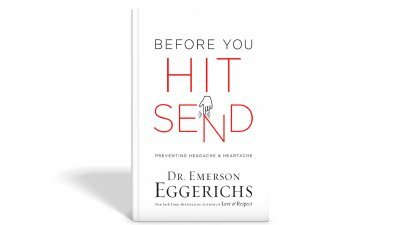 This book will enable mom’s to connect with their sons in ways they long to do. Video: Why Does a Wife Withdraw From Her Husband? Video: Why Does a Husband Withdraw From His Wife? What is Love and Respect? We believe love best motivates a woman and respect most powerfully motivates a man. Research reveals that during marital conflict a husband most often reacts when feeling disrespected and a wife reacts when feeling unloved. We asked 7,000 people this question: when you are in a conflict with your spouse or significant other, do you feel unloved or disrespected? 83% of the men said “disrespected.” 72% of the women said, “unloved.” Though we all need love and respect equally, the felt need differs during conflict, and this difference is as different as pink is from blue! We conduct conferences and provide resources to the married, divorced, separated, dating and single. Men and women will learn how to resolve conflict, dealing with the negative reactions (the crazy cycle). They will also learn how to motivate each other by meeting each other’s need (the energizing cycle). Even those who feel hopeless in their relationships will gain understanding on how to handle an indifferent or unresponsive partner (the rewarded cycle). Each cycle centers on two concepts: love and respect. These two words surface in social research and the bible (Ephesians 5:33) as the two key ingredients for a successful marriage. 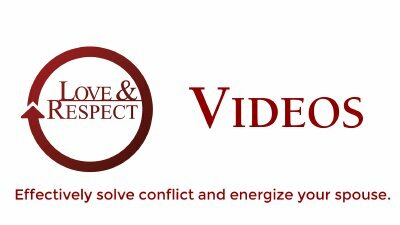 From our research, those attending the Love and Respect conference, watching the Love and Respect DVD in small groups, or reading the Love and Respect resources, are experiencing understanding, forgiveness, reconciliation, change, and hope. Through personal enrichment, they go on to minister to others in small groups. Check out our resources – especially the testimonies. God bless! We believe love best motivates a woman and respect most powerfully motivates a man. Research reveals that during marital conflict a husband most often reacts unlovingly when feeling disrespected, and a wife reacts disrespectfully when feeling unloved. We asked 7,000 people the question, "When you are in a conflict with your spouse or significant other, do you feel unloved or disrespected?" 83% of the men said "disrespected" and 72% of the women said "unloved." Though we all need love and respect equally, the felt need differs during conflict, and this difference is as different as pink is from blue! In this week’s episode Emerson and Jonathan share that they are taking a sabbatical from the podcast. This leave of absence, so to speak, is occurring in order to produce more in depth resources on marriage, parenting, for businesses, and anywhere in between. They have exciting goals and share them with you in this episode. 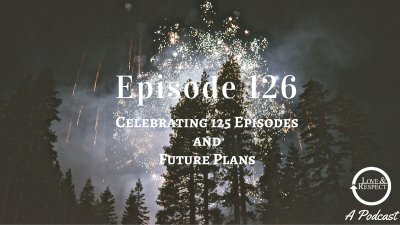 Also covered is what it has meant to them to produce these 125 episodes. Finally, they believe the information is not time sensitive and will be useful tomorrow and five years from now. The episodes will remain an archive that you can listen to and share with others. Thank you for joining them these last 2.5 years and they look forward to continuing to provide meaningful, life changing content. We can say "thanks" but not be grateful. We can mouth words but our hearts are elsewhere. We are fixated on ourselves. We have probably all seen this in ourselves. The Bible says in 2 Timothy 3:2 that people can be "lovers of self... ungrateful." We can even sing a song of thanks while in a worship service at church but inwardly dwell on the hurt and offense we feel toward someone who wronged us the day before. 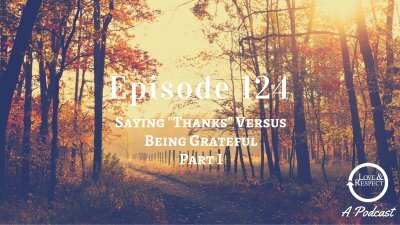 Join Emerson and Jonathan in part 2 this week and continuing the conversation about gratefulness but focusing on the intangible. We can say "thanks" but not be grateful. We can mouth words but our hearts are elsewhere. We are fixated on ourselves. We have probably all seen this in ourselves. The Bible says in 2 Timothy 3:2 that people can be "lovers of self... ungrateful." We can even sing a song of thanks while in a worship service at church but inwardly dwell on the hurt and offense we feel toward someone who wronged us the day before. 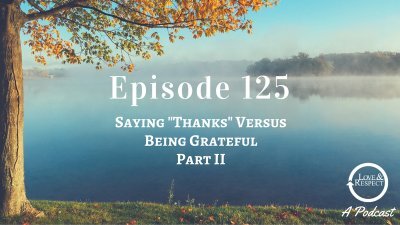 Join Emerson and Jonathan this week in this two part series which starts with how we can be grateful for the tangible things in our lives. What is the Issue? Children need to honor parents and show this in their respectful attitude and obedient actions. However, many parents do not always feel respected nor obeyed so they seek methods that will motivate the child to be respectful and obedient. How do we deal with this Issue? There are right ways of dealing with this and wrong ways. 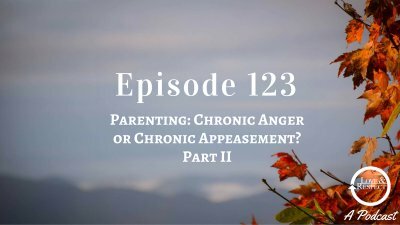 Join Emerson and Jonathan in Part I this week as they explore this topic. 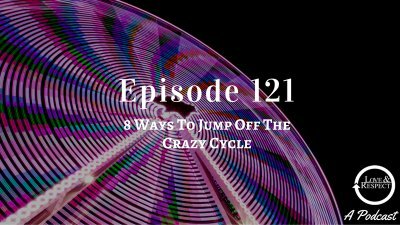 Join Emerson and Jonathan this week as they discuss 8 ways to prevent and get off the Crazy Cycle (see Episode 1 for a deeper explanation of the Crazy Cycle. Examples include what to do when you see the spirit of your spouse deflate, accepting some trouble as normal, and trusting in each other's goodwill. Join Emerson and Jonathan for Part III of this three part series. Why is marital paradise lost? Why do couples feel they have left Eden and live in a jungle of sorts? Since Scripture indicates couples will have trouble in this life why are husbands and wives unprepared? The answer is simple: they do not anticipate and accept the four seasons. 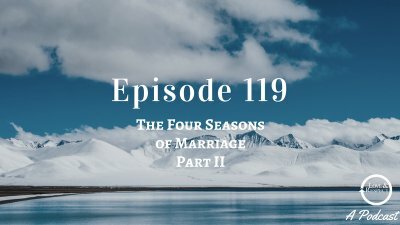 In one way or another all couples will go through the four seasons. Those who go through them without defeat do so because they anticipate and accept the process. Join Emerson and Jonathan for Part II of this three part series. Why is marital paradise lost? Why do couples feel they have left Eden and live in a jungle of sorts? Since Scripture indicates couples will have trouble in this life why are husbands and wives unprepared? The answer is simple: they do not anticipate and accept the four seasons. 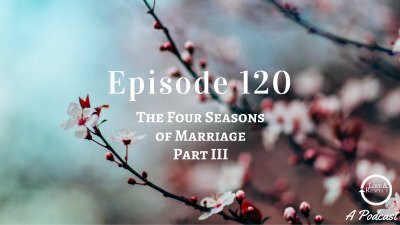 In one way or another all couples will go through the four seasons. Those who go through them without defeat do so because they anticipate and accept the process. Why is marital paradise lost? Why do couples feel they have left Eden and live in a jungle of sorts? Since Scripture indicates couples will have trouble in this life why are husbands and wives unprepared? The answer is simple: they do not anticipate and accept the four seasons. 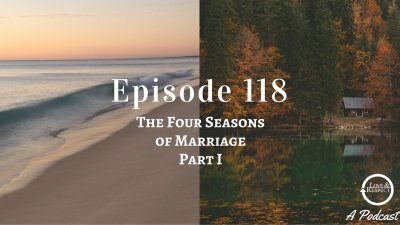 In one way or another all couples will go through the four seasons. Those who go through them without defeat do so because they anticipate and accept the process. Join Emerson and Jonathan for Part I of this series.